E is for Explore! : French Fry P.O.S. Educational french fry games are all the rage! You can make word or fact family fries, as well as simple 123 counting fries. You could also do synonym fries. I made up french fry p.o.s. to help kids work on parts of speech, as well as to encourage creative writing. Label three french fry cartons: noun, verb, adjective. 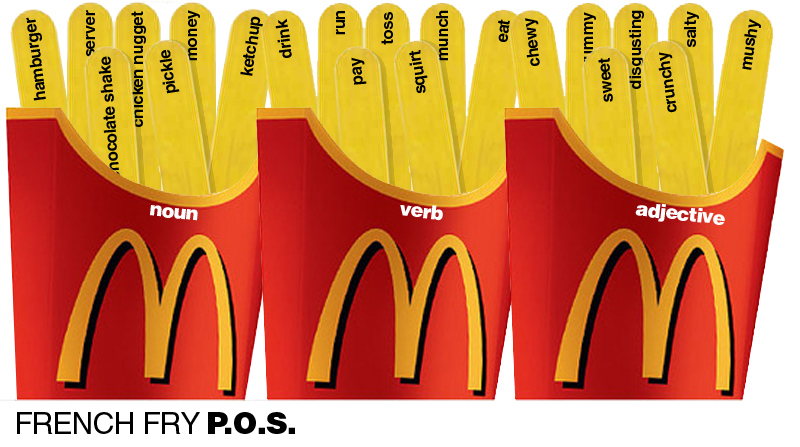 Write various words on yellow painted popsicle sticks that have to do with fast food (nouns, verbs, and adjectives). Then, mix the "fries" up on the table. Kids sort the fries into the correct boxes. After they sort them, they choose one noun, verb, and adjective to write a silly fast food sentence. Get creative with your word choice and encourage kids to create the silliest sentence they can think of.